PD 123319 is a potent, selective AT2 angiotensin II receptor antagonist with IC50 of 34 nM. Naunyn Schmiedebergs Arch Pharmacol, 2016, 389(12):1333-1340. PD123319 purchased from Selleck. Ang II-induced MMP-2 protein expression through AT1 receptor in ex vivo cultured IAAA aortic walls (A) Ex vivo cultured aortic pieces from IAAA patients (n = 5) were incubated in the presence of different concentrations of Ang II for 48 h. (B) Ex vivo cultured aneurysmal aorta walls were pre-treated with either candesartan (10 µM, AT1R inhibitor) or PD123319 (10 µM, AT2R antagonist) for 48 h, followed by 1 µM Ang II treatment for 48 h. The group without Ang II incubation was used as control. **P < 0.01 vs. untreated control group; ##P < 0.01 vs. treated with Ang II alone. CA, candesartan; PD, PD123319. Acta Biochim Biophys Sin (Shanghai), 2015, 47(7):539-47.. PD123319 purchased from Selleck. Ang II induces MMP-2 protein expression and ERK phosphorylation ASMCs via AT1R. (a) ASMCs were pretreated with 0.1 μM candesartan (CA, selective AT1R inhibitor, 30 min) or 1 μM PD123319 (PD, selective AT2R inhibitor, 30 min) followed by stimulation with 0.1 μM Ang II for 2 min six-well plates. Western blot was performed to assess the levels of ERK phosphorylation in cell lysates. Top panel: Graphs show the relative p-ERK1/2 protein levels, respectively, normalized to total ERK1/2 relative to control. Bottom panel: Ratio of p-ERK1/2/t-ERK1/2 protein expression, respectively, evaluated using Western blot analysis from a representative experiment. Shown are mean±SEM of three individual experiments. **P < 0.01 vs. untreated control cells; ##P < 0.01 vs. cells treated with Ang II. (b) ASMCs were incubated with 1 μM candesartan or 10 μM PD123319 for 60 min before stimulation with 0.1 μM Ang II for 24 h in six-well plates. Western blot was used for analyses of the levels of MMP-2 expression in cell lysates. Top panel: Graphs show the relative MMP-2 protein levels normalized to GAPDH relative to control. Bottom panel: Ratio of MMP-2/GAPDH protein expression from a representative Western blot experiment. Shown are mean±SEM of three individual experiments. **P < 0.01 vs. untreated control cells; ##P < 0.01 vs. cells treated with Ang II. Exp Biol Med (Maywood), 2015, 240(12):1564-71. . PD123319 purchased from Selleck. Blankley CJ, et al. J Med Chem, 1991, 34(11), 3248-3260. Boulay G, et al. Mol Pharmacol, 1992, 41(4), 809-815. Estrup TM, et al. J Renin Angiotensin Aldosterone Syst, 2001, 2(3), 188-192. Tamura M, et al. J Hypertens, 2000, 18(9), 1239-1246. Sacubitril/valsartan (LCZ696), consisting of valsartan and sacubitril in 1:1 molar ratio, is an orally bioavailable, dual-acting angiotensin receptor-neprilysin inhibitor (ARNi) for hypertension and heart failure. Phase 3. Endoxifen HCl, the active metabolite of Tamoxifen, ia a potent and selective estrogen receptor antagonist. Phase 2. Licochalcone A is an estrogenic flavanoid extracted from licorice root, showing antimalarial, anticancer, antibacterial and antiviral activities. Phase 3. Losartan is an angiotensin II receptor antagonist, competes with the binding of angiotensin II to AT1 receptors with IC50 of 20 nM. Features:Losartan has a major active metabolite, EXP 3174. 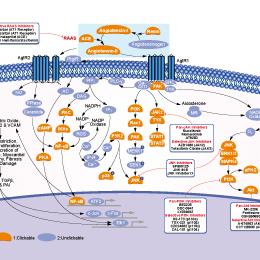 Aliskiren hemifumarate is a direct renin inhibitor with IC50 of 1.5 nM. Telmisartan is an angiotensin II receptor antagonist (ARB) used in the management of hypertension. Azilsartan Medoxomil is a potent angiotensin II type 1 (AT1) receptor antagonist, inhibits the RAAS, with an IC50 of 2.6 nM, exhibits >10,000-fold selectivity over AT2. Candesartan is an angiotensin II receptor antagonist with IC50 of 0.26 nM. Features:Primarily used for the treatment of hypertension. Perindopril Erbumine is a potent ACE inhibitor with IC50 of 1.05 nM. Enalaprilat is an angiotensin-converting enzyme (ACE) inhibitor with IC50 of 1.94 nM. 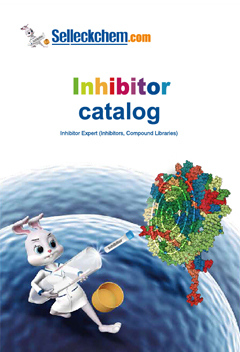 Features:The 1st dicarboxylate-containing ACE inhibitor developed to overcome captopril limitations.